Okay, so I’m game for trying just about anything. Except for things that kinda disgust me. And mayonnaise is just one of those things. 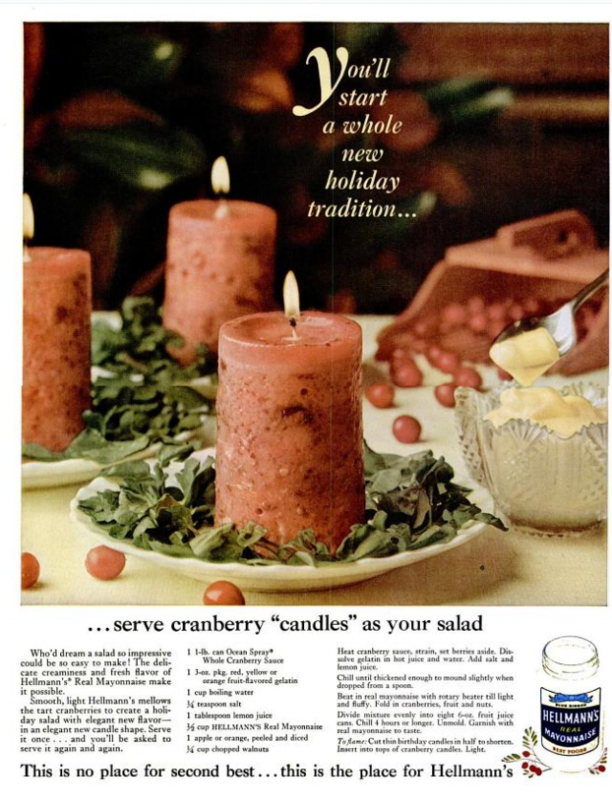 That’s why this early ’60s ad for cranberry “candles” had my stomach churning, and my brain asking, “Um, why?”. Who’d dream a salad so impressive could be so easy to make! The delicate creaminess and fresh flavor of Hellman’s Real Mayonnaise make it possible. Directions: Heat cranberry sauce, strain, set berries aside. Dissolve gelatin in hot juice and water. Add salt and lemon juice. Chill until thickened enough to mound slightly when dropped from a spoon. Beat in real mayonnaise with rotary beater till light and fluffy. Fold in cranberries, fruit and nuts. Divide mixture evenly into eight 6-oz. fruit juice cans. Chill 4 hours or longer. Unmold. Garnish with real mayonnaise to taste. To flame: Cut thin birthday candles in half to shorten. 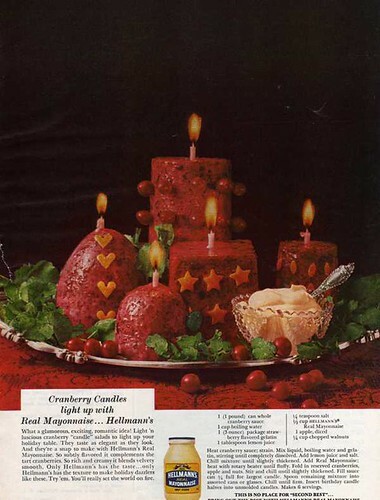 Insert into tops of cranberry candles. Light.